Before I get to Phil Jones and the Kazakh copper smelter, I wish to report that, somewhat to my own amazement, I’ve been able to get a surprisingly close approximation of a few HadCRUT3 gridcells from third-party data. Here is a comparison of the annualized HadCRUT3 gridcell 47N;67E as compared to GHCN v2 for Karsakpay (alternate Karsakpai; Karsakpaj). Now this replicatio raises as many questions as it answers: why does the gridcell end in 1990? is there more up-to-date data? what accounts for the slight difference in end dates? is Karsakpay a “rural” site as stated in Jones et al 1990? Top – HadCRUT3 for 47.5N;67.5E; bottom GHCN v2 Karsakpay. Red and black are tow different GHCN v2 versions. To achieve this replication, I downloaded the v2.mean zip file from GHCN here (there is also an adjusted file which I’ve not examined yet). I’ve started looking at Russian data using the station identifications from Warwick Hughes list. He has proposed identifications for 36 of 38 sites in Jones et al 1990. Of this list, I’ve located digital versions for 14 so far at GHCN v2, one of which is Karsakpay in Kazahstan. I’ll try to discuss more of these gridcells during the next couple of months. I’ve examined all 14 series and each gridcell has some point of interest. From the GHCN v2 data, I calculated the monthly “normal” for the 1961-1990 period and then normalized the monthly data. In this case, the start and end, general shape and scale of the two series match rather well and so one can safely conclude that the primary weighting in this particular HadCRUT3 gridcell comes from the Karsakpay station data. Now there are some curiosities about the end date. First, the HadCru version visually goes a little later – and, if you examine the raw data, you see that the HadCRU series goes to 1990, while the GHCN v2 series goes to 1989. So, contrary to the information provided by David Palmer, the CRU Freedom of Information officer to Willis Eschenbach, in this particular case at least, the CRU version is not the same as the GHCN v2 version, although they obviously overlap. There is a version going to 1990 at CDIAC NDP048 – an excellent report with much information on Russian station histories for people interested in the topic. Does it seem curious to you that the data only goes to 1990? It seems very odd to me – did they stop taking temperatures in Kazakhstan? I did locate online digital data (daily max; min) going 4 more years to 1994, from meteo.ru here . These 223 sites are the same 223 sites as at NDP048. From this information, I calculated first daily averages of the max-min; then monthly averages, then the 1961-1990 normals, then the monthly anomalies, then the annual average anomaly, yielding the graphic shown below. As you see, the HadCRUT3 version does not include the closing temperature downtick from 1990 to 1994, which resulted in 1994 temperatures being below the 1961-1990 average. While I’ve been able to update this series to 1994, it seems incomprehensible to me that data is not available up to 2006. Isn’t CRU being paid to collate this data? Why haven’t they done it? Why didn’t they pick up the readily available data to 1994 – personally I attribute this to sloppiness, not to intentional editing out the closing downtick. Karsakpay monthly anomaly as calculated from meteo.ru daily data. I’m discussing this partly out of personal interest and because there’s an interesting story here that’s barely known. Browsing Karsakpay, I came across this interesting picture showing the rustic “rural” character of Karsakpay. Figure. 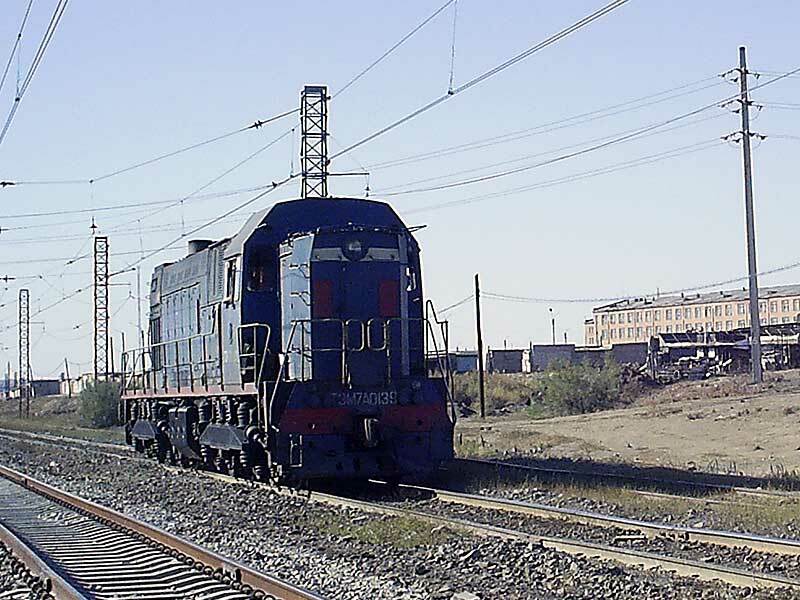 Shunting diesel loco TEM7A-0139 from loco depot of “Kazakhmys” corporation (copper plant). Line from Karsakpay copper mine to Zhezkazgan copper plant. Zhezkazgan city, Karaganda province, Kazakhstan, September 30, 2006. In 1928 the exploitation of copper ore deposit was started. Then Karsakpai Copper-Smelting Plant was put into operation in 1929. The same year K.I. Satpayev with his family moved from Moscow to Karsakpai and was in charge of the Plant Geological Department. The tireless work to reveal enormous ore reserves resulted in discovery of large reserve that had been estimated earlier. K.I.Satpayev published his first monograph “Zhezkazgan Copper Ore Region and its Mineral Resources” (1932). I think that there’s a very interesting connection between the Noranda smelter (which I visited on a number of occasions) and the Karsakpay smelter. Like the Karsakpay smelter, the Noranda smelter was built in 1929. Part of the folk lore at Noranda in the 1970s was that there was an identical smelter built somewhere in Russia. I think that the engineering for the Noranda smelter was done by a New York engineering firm and, in the late 1920s, there was a brief pre-Stalin period in which foreign engineering was welcomed into Russia. Of course, the door was shut in the 1930s and by the 1970s, not much was known about Russian copper smelters. My guess is that the Karsakpay copper smelter was a clone of the original Noranda smelter – with big reverbatory furnaces. Noranda converted these old-fashioned furnaces to its own process in the 1970s. But I saw the old furnaces in operation and I’ve got a pretty good idea of such an industrial installation at the town of Karsakpay would have looked like. Would I be inclined to call a temperature station by a big copper smelter “rural”? I wouldn’t. But maybe Borat would. A caveat here: the caption to the photograph above refers to a smelter at Zhezkazgan (Dzhezkagan) rather than Karsakpay and other modern information shows a smelter there with Outokumpu furnaces. It’s possible that the “Karsakpay copper smelter” is a misnomer for the Zhezkazgan smelter and there is only a mine at Karsakpay and not a smelter. I’m sure that this was thoroughly investigated by Phil Jones when he was determining that Karsakpay was a rural station. Maybe I should ask him. This entry was written by Stephen McIntyre, posted on Feb 28, 2007 at 12:33 PM, filed under Jones et al 1990, Surface Record. Bookmark the permalink. Follow any comments here with the RSS feed for this post. Both comments and trackbacks are currently closed. Indeed! In fact, given the lack of enviro controls in the USSR / CIS until very recently, there may have been practices at Karsakpay which were / are far more extreme than anything in North America. I am picturing certain slag handling practices, for example. Kyshtym is where Zhores Medvedev said the Soviets had a large chemical explosion within the nuclear waste dump site in a local lake bed. Apparently several hundred square miles were contaminated with radioactice waste, including large amounts of Sr90. Evacuated population ranged from 10,000-300,000 people, and the area today is fenced off. Los Alamos has a pdf report here. Reading the caption of the picture again, it looks like the smelter is in Dzhezkazgan rather than Karsakpay – which I guess only has a mine. part of the Karaganda region. I don’t think it was near the region Steve is discussing. With regard to the ending of the record circa 1990: Joe D’Aleo has a very interesting plot of the number of active reporting stations worldwide and the “global mean temperature”. Right about 1990, the number of station dropeed dramatically and suddenly, and the temperature likewise increased. He stated that most of the closures were rural Soviet stations that folded when the Soviet Union collapsed (and the number is in the thousands). Of course, the point of the slide is to question whether the reported global temperature rise of the 1990s is real, or an artifact of changing reporting. I haven’t been able to find the plot in the little time I have available now, but I remember that someone posted it to comments in one of the threads within the last couple of weeks. There is only a problem with mislabelling a station as “rural” if the station is in an area that is developing and thus warming over the relevant period. So if this “smelter” temperature station became a major smelter in 1929, then it would not seem to be producing a spurious trend in the 1980s and 1990s. For an example of a trend, my hometown of Pasadena is in the temp network, yet its temp over the last 100 years has increased about 6 degrees F as the Los Angeles area has grown tremendously. That is what I think of as a spurious trend. 6: Doesn’t it depend on smelter production or land use changes during that time? If production increased or population increased, there might be an increase in UHI effects. Any arbitrary correction for UHI that does not reflect the local conditions will have the result of compromising the fidelity of the resulting temperature history. You are correct in the statement that if the heat island is unchanged over the last 40 years you would not be seeing an effect in the recent history. However the temp anomaly goes into the ultimate CRU grid calculation and final GMT. Any uncorrected or heat island effect will add to the uptick we see in the GMT, whether the bias begins in 1930 or 1960 won’t change the fact that it is still there by 2000. Add in all the other uncorrected heat island biases which will kick in at different times and you get the resulting unprecedented climb evidenced in the final GMT. There is a quite important airport in Karaganda and I don’t think they have stopped recording temperatures there in the 1990’s. Domestic flights in Soviet made usually stops in Karaganda, also after 1990. Just by chance I made some excursions there in 1990 during an expedition to Kazakstan and Kirgistan. To me that place resembled a rural place, except for the air field. Of course there might still occur UHI because of gradually increasing flight traffic. I consulted that Russian server, where I tried to locate some of the Warwick’s stations and in Kazakhstan, at present there is NO station named Karsakpaj or other with the same number 35663. There’s a weather forecast for Karsakpay (as opposed to Karsakpaj)here http://www.qwikcast.com/cgi-bin/forecast.cgi?zip=Karsakpay,KZ&pid=weatherbase . Karaganda is distant from Karsakpaj – try Google Earth. And Karaganda is listed on that Kazakhstan page, whereas Karsakpaj is not. I thought that we are talking about Kazakstan now. Or former Sovietunion. Isn’t both Karakpay and Karaganda in Kazakstan ? Karsakpay is very close to Baikonur (near the space center) in Kazakastan, about 400 km SW of Karaganda (city). Karaganda region is quite large and its eastern part has border to Semipalatinsk. Karsakpay at least is not contaminated by nuclear tests. Both Baikonur and Karsakpay are situated in the western part of Karaganda region. In addition to confusion from transcribing Cyrillic, there are quite a few places in Kazakhstan which had both Russian names and Kazakh names. In the aftermath of independence in the early 90s, the former were dropped in favour of the latter.